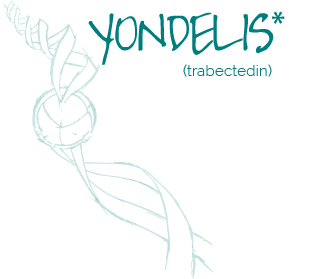 YONDELIS®* (trabectedin) is a marine derived antitumoral agent discovered in the colonial tunicate Ecteinascidia turbinata and now produced synthetically. Yondelis is indicated for the treatment of adult patients with advanced soft tissue sarcoma, after failure of anthracyclines and ifosfamide, or who are unsuited to receive these agents. Efficacy data are based mainly on liposarcoma and leiomyosarcoma patients. Yondelis in combination with pegylated liposomal doxorubicin (PLD) is indicated for the treatment of patients with relapsed platinum-sensitive ovarian cancer. The indication in Ovarian Cancer is not approved in Switzerland.